Home Bike ReviewsBenelli	Benelli TNT 600i Review: Is it a worthy package? The TNT 600i is one of Benelli’s awesome package.We review this package to find more. This brand seems to be the harbinger of the desired motorcycle of many bike riders in India. The TNT 600i actually delivered what it promises on all fronts however some of it aspects held it from achieving true greatness. Well the TNT 600i is not what you might qualify as beautiful in the commercial sense, but it has a lot of presence demonstrating a bike with great puissance. Its big tank extensions along the large sculpted fuel tank are a distinct visual touch, also its chunky four cylinder engine and the four shiny exhaust headers that protrude from it gives this bike great attraction. It has neat stocky cast alloy swingarm and a nice side mounted rear shock absorber. At the back end, it has very impressive two triangular underseat exhausts. This motorcycle has all its power too high in the rev range which makes it annoying for one used to bigger bikes. Its performance is amazing especially with its 600cc inline four cylinder engine which has an 85hp of power on tap along with 54.6Nm of torque. In absolutely soaking situations the bike manages a 100kph time of 5.49 seconds and when the roads are dry this time could be much faster. The nature of its engine is great with maximum horsepower of 11,500rpm and its maximum torque hitting almost 10,000rpm. The six-speed gearbox of the TNT 600 has closely stacked ratios which compensate for the great use of its engine and torque. This makes it easy to move through the gears when wanting to overtake. When the revs are low, this bike moves along smoothly and needs more throttle displacements to increase the revs above 7000rpm which will keep the bike going. 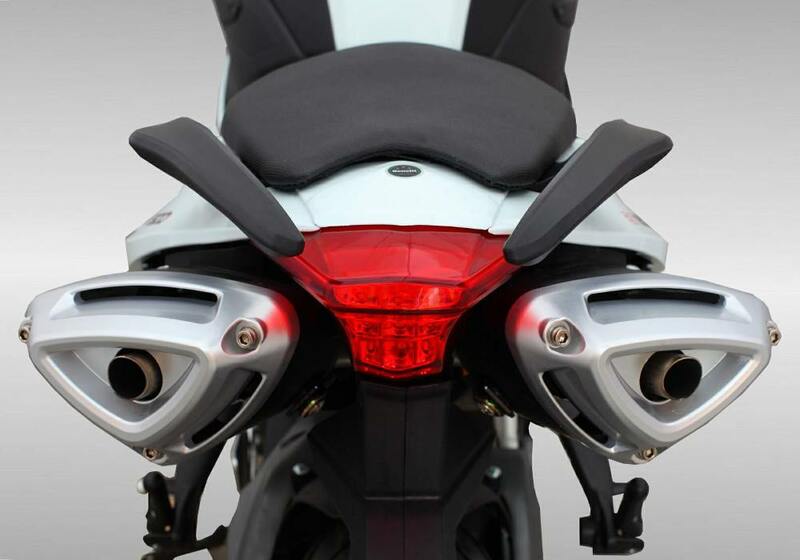 The addition of the ABS by the Benelli has greatly impacted the braking system of the TNT 600. It offers a more confident feeling when pulling the stop lever in an emergency. On bad wet roads, the TNT 600 ABS manages a pretty stopping distance of 29.41 metres in 3.03 seconds when the brakes are stammered at 80kph. Being in its saddle is quite comfortable and even though its 800mm seat height offers it a great height, its slim waist can allow most rider’s feet to reach the ground comfortably. This gives you an upright posture and the nice wide handlebars allow you to move it easily in slow speed conditions despite its heavy nature. The TNT 600 is not razor sharp handling despite of its massive 50mm upside down fork at the front and its adjustable monoshock at the back. Its weight is greatly felt when trying to switch in a fast way from one corner to another. And easily enjoyed on milder flowing corners rather than tight, fast changes of direction. Its Pirelli Angel ST tyres seems to be designed more for a touring role nevertheless it’s awesome as it provides traction in all conditions and impresses one with a great performance on wet roads. The TNT ride quality is fairly plaint and its suspension doesn’t show any signs of crashing over bumps. With its pretty ergonomics, riding this bike on a daily basis, handling commuting as well as occasional touring and sport riding duties with the same amount of ease will make you happy. Just like some other bikes the TNT 600 baffles you when you first ride it. Its middle weight might create a little bit of disappointment in you but giving it a little time and letting it grow in you will definitely make you enjoy it. Then will you realize it is a very flexible sort of motorcycle with the ability to transport a wide variety of riders. Another great aspect of the TNT 600 is that it offers unintimidating, but appreciable performance with a melodious four-cylinder soundtrack playing in the background putting you in your comfort zone and being just what is desired in the Indian market. The Benilli TNT 600 might have some ways to go to become a magnificent bike. It has a price of Rs 7.32 lakh, which is a great value for money package. With its added safety net of ABS, a proposal that makes it admirable and unable to ignore.